whatwhat! ANOTHER cookie recipe this week? Thats right homies. Another cookie recipe. And its EASY and AWESOME. Have at it! Note: If you’re looking for more gluten free holiday cookies, check out my Gluten Free Vegan Shortbread, Gluten Free Vegan Gingerbread Cookies, and Gluten/Dairy/Egg Free Pumpkin Spice Cookies. 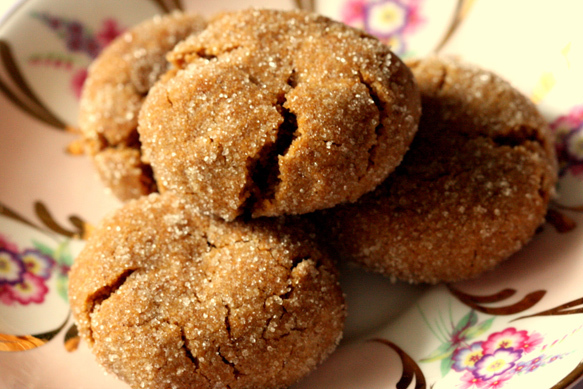 These molasses gingersnaps are just phenomenal, and super easy. You will find the dough is quite soft and moist, but the coconut flour in them soaks the moisture right up. I would suggest, if you want an even chewier cookie, use solid palm oil instead of grapeseed oil (locally you can find it super cheap at Pantry Plus. Elsewhere, Spectrum makes it and you can buy online). For Paleo/primitive diets- molasses is a bit of a cheat… and use arrowroot stach because at least it is based from a tuber (although this isn’t a TRUE paleo recipe). The great thing about these gingery cookies is that they are irresistible! Chewy, soft and gingery, you’ll keep going back for more. Now, whatever you do, make sure to bake these on parchment paper or a baking mat. Otherwise, they will certainly burn on the bottom. See substitutions at the bottom of the recipe for help switching ingredients. Mix the dry ingredients, then sift them. Add the wet to the dry. Roll the dough in balls smaller than a golf ball. Dip the balls in the sugar. Place on cookie sheet (use parchment paper or a baking mat, or else they will certainly burn). Bake at 350 for 6-7 minutes. If you want them dryer, bake till 8 minutes. When ready, press down gently with a spoon. Let cool 20 min before placing on cooling racks. Tapioca Starch: arrowroot, potato, or corn starch. Grapeseed Oil: melted palm oil, olive oil or canola oil. Cane Sugar: granulated white sugar, or sucanat. So glad you liked the cookies :) I think the different kinds of molasses might have different flavours- i think fancy molasses and cooking molasses (i believe?) are two different flavours- one might be stronger than the other…. I think you could probably substitute in some maple syrup with no problme . Just in case they get a little crumbly, try adding a tsp or two of groupnd flax, or ground chia, or agar powder, or unflavoured gelatin powder (not vegan)- all are great binding agents in case you need a little more stick! :) Happy baking! have you tried making these with half the molasses and the other half maple syrup(grade B/ organic of course)? I made these tonight and I was really surprised, in a fabulous way, by the texture! I thought for sure they would be crumbly, but no! not at all! Incredible texture. Very strong molasses flavor, my kids seem to enjoy! So glad they don’t need Xanthan gum. i would try half hazelnut and half cashew- but- i’d also make sure to add in a binding agent to help them stick together. try 2 tsp of agar powder or unflavoured gelatin, or 1 tbsp ground chia or ground flax added to the wet ingredients to soak while you prep the dry ingredients. if you can’t do any of those, yo ucould try 1 tbsp of psyllium husk added to the wet ingredients- please let me know how they turn out- i’d love to suggest your modifications for almond-free visitors :) Also- i think soaked pureed figs or prunes or dates can work as a binder as well. good luchk- happy baking! What do you think about substituting cashew or hazelnut flour instead of almond? Will it work? I did it with extra virgin olive oil, and the heartiness of the almond flour and coconut flour and molasses totally worked with it… If you want to do coconut oil, you may need to bake the cookies for shorter time (different melting point). Also, I noticed, coconut oil has an awesome flavour, but since its solid at room temperature you will notice that the cookies will be a touch more crunchy rather than chewy. If you reallly reallly want chewy, try melted organic palm oil (Spectrum products makes it, its pretty cheap and its not hydrogenated). It will require a little longer cooking time but result in super chewiness. Think melted coconut oil would work? I don’t have grapeseed and my extra virgin olive oil would be gross in them.